Today (Columbus Day) I submitted my paper “GO Beyond GDP: Introducing Gross Output as a Top-Line in National Income Accounting” to the American Economic Review. I think it appropriate to submit it on Columbus Day as I believe GO is a major discovery in national income accounting and one of the most important macroeconomic event since GDP was invented in the 1940s. 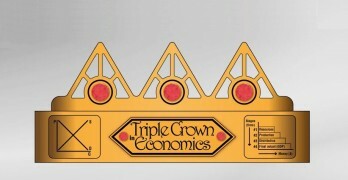 I consider GO the missing piece of the macroeconomic puzzle. By including the supply chain, GO restores the importance that the business sector — the entrepreneur, the inventor and capital investment — plays in growing the economy. 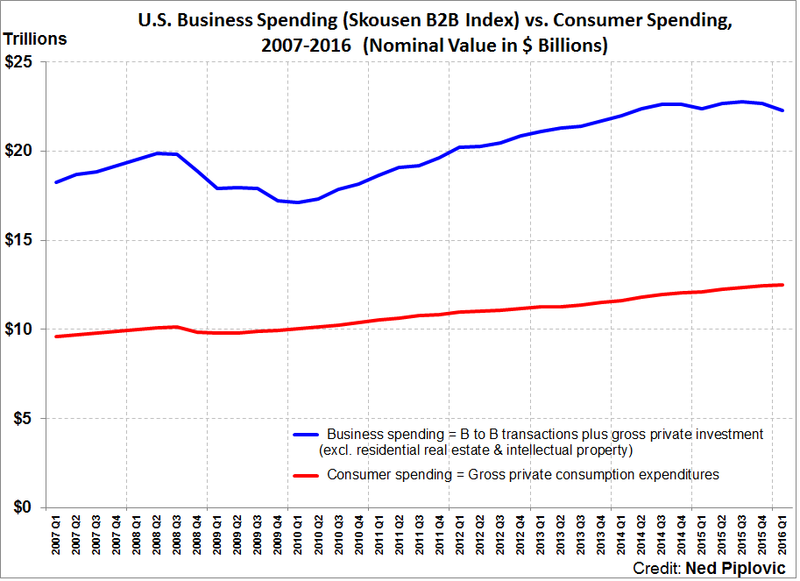 It debunks the idea that “consumer spending drives the economy.” It turns out that business (B2B) spending is almost double the size of consumer spending in the US, and far more cyclical. Now, the question is, will the AER editors recognize this paradigm shift in macroeconomics? It certainly helps that the government — Bureau of Economic Analysis (BEA) — has adopted and is now publishing GO on a quarterly basis, just like GDP. 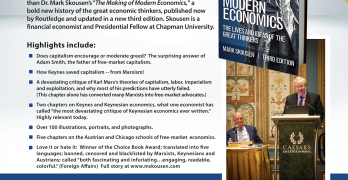 It’s also being added to next edition of many of the major economics textbooks. 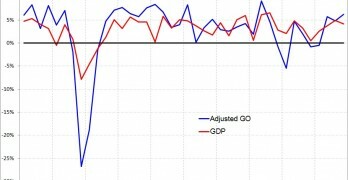 Government starting measure gross output (GO): In April 2014, the Bureau of Economic Analysis began publishing a new measure of the aggregate economy called gross output (GO), the first macro measure to be released on a quarterly basis since gross domestic product (GDP) was invented in the 1940s. What is GO? GO is a broader measure of economic activity, adding up sales/revenues at all stages of production, and serves as a complement to GDP. 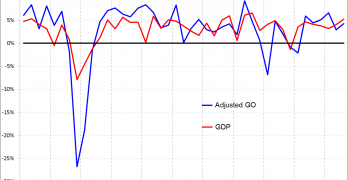 The BEA now defines GDP in terms of GO minus intermediate production. 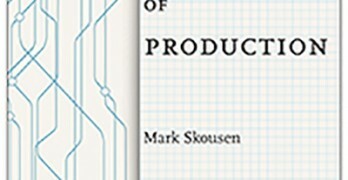 GO attempts to measure the production process or the “make” economy while GDP is a measure of final goods and services, or the “use” economy. 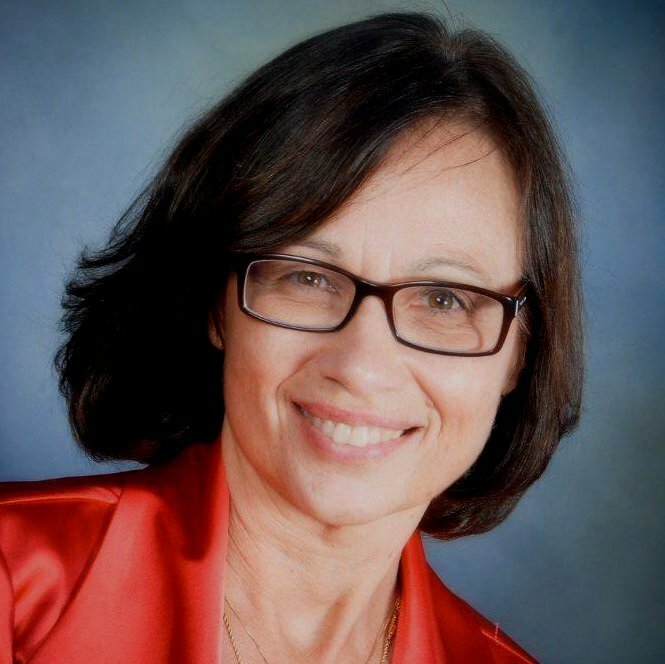 New top line in national income account: I make the case that GO and GDP together should play a vital role in national accounting statistics, much like the top line (sales) and bottom line (earnings) in quarterly financial statements. Top line and bottom line accounting are employed in compiling the quarterly earnings reports of publicly-traded companies. 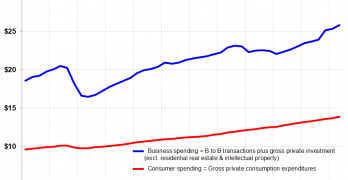 Does consumer spending drive the economy? The media often reports that “consumer spending is two-thirds of the economy,” based on a misuse of GDP as a measure of the economy. 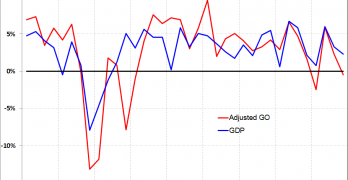 The source of the fallacy is that GDP measures final spending only. 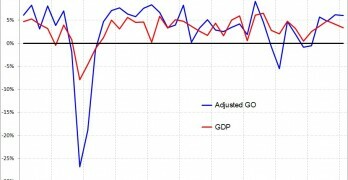 GO is the more complete measure of total economic activity. 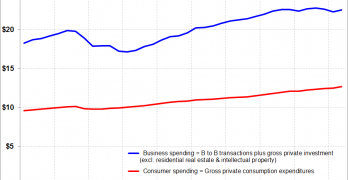 It demonstrates that business spending is a significantly larger segment of the economy than consumer spending is. 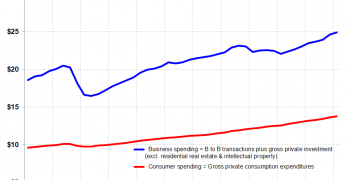 In fact, business spending (B2B) is almost double the size of consumer spending. Business spending is 60% of total economic activity, while consumer spending is only about one third (not two-thirds as normally reported). GO and GO by Industry may be helpful in forecasting the direction of the economy. 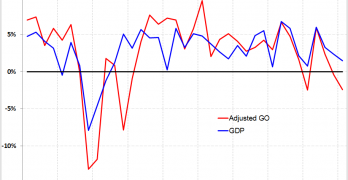 Business spending tends to be more volatile than GDP. 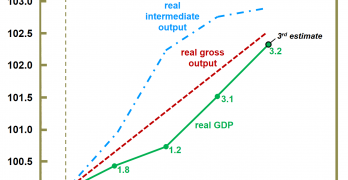 Earlier-stage and intermediate inputs in GO may also be helpful in forecasting the direction of economic growth. In this paper, I argue that gross output should be the starting point of national income accounting. 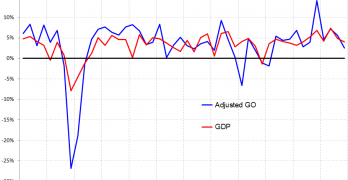 GO is also more highly correlated with leading macroeconomic indicators of the business cycle than GDP is and is, additionally, more intellectually consistent with the economy-wide growth at all stages of production and distribution that growth theory attempts to model. “GO is better correlated with financial-price movements than most of the other indicators. It tends to portray the economy as more cyclical than real GDP does, the recession of 2008-09 as deeper, and the recovery as slower. 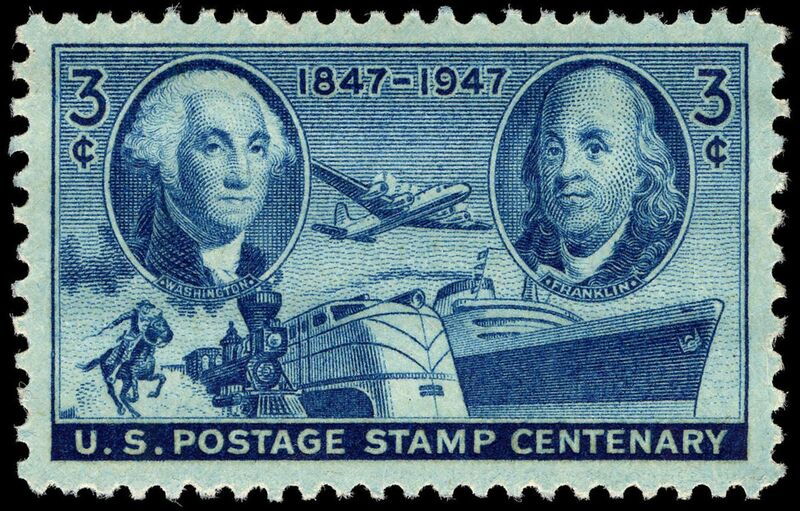 The universal use of real GDP as a measure of the economy’s vitality is subject to misunderstandings, pitfalls and criticism — especially in the short run. GDP includes only ‘final’ goods and services, leaving out the huge economy that consists of businesses buying and selling intermediate goods to one another.” – David Ranson, chief economist, H. C. Wainwright Economics. I am happy to announce that the first professional economics journal (Eastern Economic Journal) has published an article on Gross Output, the new macro statistic I’ve been advocating and now has been adopted by the federal government. GO is an attempt to measure spending at all stages of production, the first statistic to be adopted since GDP was invented in the 1940s. It is a way of measuring Hayek’s triangle, and I’ve found that the quarterly GO statistic a better, broader measure of the economy and a good predictor of final output (GDP). In 2014, it has been rising faster than GDP, suggesting that the earlier stages of production are robust and predicting more growth ahead. 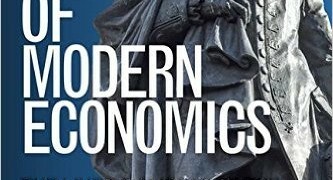 I consider the government publishing of a quarterly GO the greatest triumph in supply-side Austrian macroeconomics since Hayek won the Nobel prize 40 years ago. Austrian economists are now seeking to measure GO (or my own broader Gross Domestic Expenditures) in other countries, such as UK and Argentina. Washington, DC — Gross Output, a broader measure of U. S. economic activity published by the Bureau of Economic Analysis, held steady at $30,210.6 billion in the first quarter of 2014. “The GO data demonstrates that the economy is not as bad off as GDP figures initially suggested,” stated Mark Skousen, editor of Forecasts & Strategies and a Presidential Fellow at Chapman University, who champions Gross Output as a more comprehensive measure of economic activity. 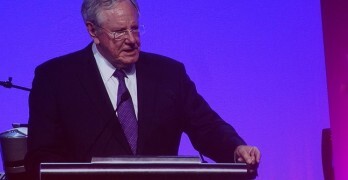 He introduced Gross Output as a macroeconomic tool in his work The Structure of Production (New York University Press, 1990). Now the BEA publishes GO on a quarterly basis in its “GDP by Industry” data. The Economist magazine rightly called French professor Thomas Piketty the new Marx, although a watered down Marx. His bestseller (rated #1 on Amazon and the New York Times) is a thick volume with the same title as K arl Marx’s 1867 magnum opus, “Kapital.” The publisher, Harvard University Press, appropriately designed the book cover in red, the color of the socialist workers’ party. The editors of the WSJ don’t allow the author to see or approve the headline or subhead, but they nailed it perfect. And I love the cartoon graphics! It’s a perfect rendition of my four stage model of the economy. 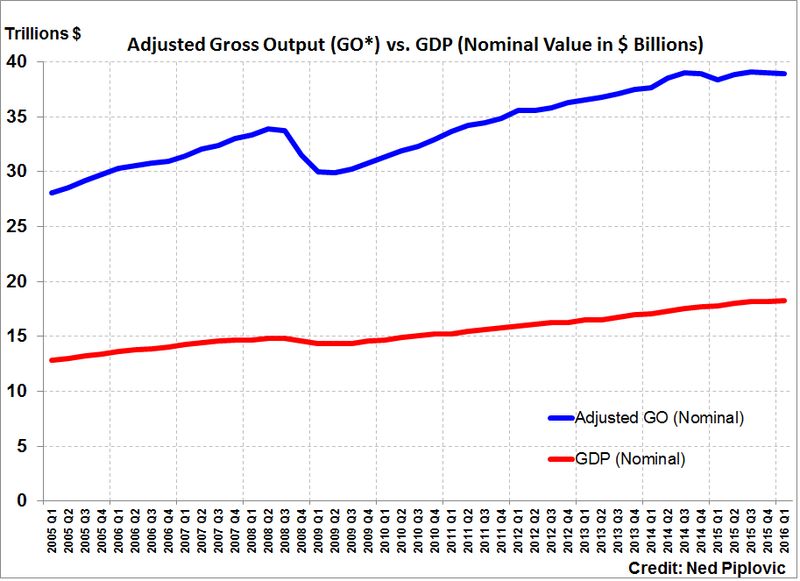 For the first time since World War II, the Federal government (Bureau of Economic Analysis) will begin publishing a new macro statistic Gross Output [GO] starting in spring 2014 at the same time it releases its quarterly GDP data. 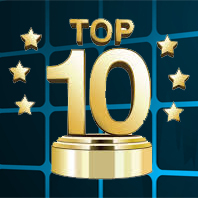 A shortened version will appear in the Dec. 16 issue of Forbes magazine (circulation over 1 million). 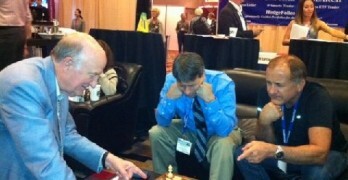 Steve Moore of the Wall Street Journal and Gene Epstein of Barron’s are looking into writing articles on GO. So is The Economist. I’m excited — this is a personal triumph nearly 25 years in the making. Most of the economics textbook writers are planning to include a section on GO in their next editions (McConnell, Parkin, Gwartney, Hubbard), and economic analysts are now starting to look at it. 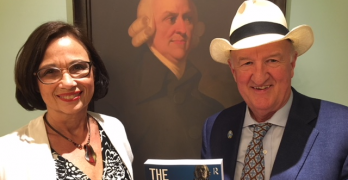 In an email, Roger Leroy Miller, professor at University of Texas at Arlington, says that he has added a section on Gross Output for his 18th edition of Economics Today. 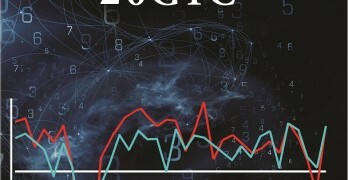 It is already part of my own Economic Logic textbook. 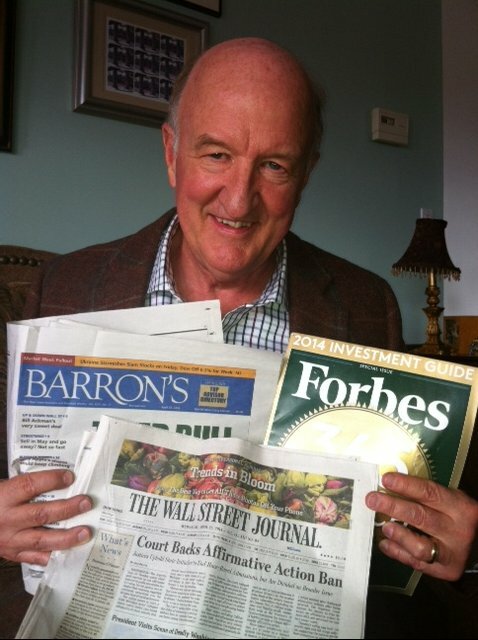 I hope you’ll check out the Forbes article, as well as Economic Logic and The Structure of Production for a more in-depth look at this important development. Has Government Adopted My New Macro Model? For several years now, I have been advocated the need for adding a new national aggregate statistic called Gross Domestic Expenditures (GDE) that measures total spending at all stages of production and not just the final stage (GDP). I believe that GDE fills in a major piece of the macroeconomic puzzle. 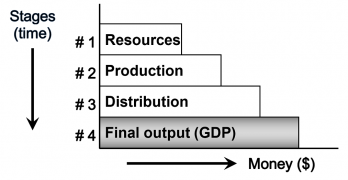 It establishes the proper balance between production and consumption, between the “make” and the “use” economy, and one that is consistent with growth theory. Most importantly, GDE and my 4-stage model of the economy are compatible with standard national income accounting and neo-classical macroeconomic analysis. You don’t have to rewrite the textbooks, just add it into the chapters. Tomorrow my wife Jo Ann and I celebrate our big 40th (ruby) anniversary. We were married on April 19, Patriot’s Day, in 1973 in Utah. Last week we went to Hawaii to celebrate. When we arrived at the Marriott Waikiki Beach Resort in Honolulu, we were given a small room with only a queen size bed and no view of the famous Waikiki Beach. I asked the desk clerk if there was any chance we could have a room with a king bed. He said nothing was available.